One cannot help but praise profusely these children and their parents for taking up this tough fight against cancer. This time we could not interact with them as they were too young and in their mother’s lap. Perhaps, they didn’t even know what has struck them. We handed over our contribution to the parents of these children while wishing them the very best. We are more than sure soon they would be up and about. Master Hardik Dangi, age 2 years. He is the son of Mr Jagdish Singh Dangi, who is a fireman and hails from Dattiya in M.P. The child is suffering from ALL (Acute Lymphocytic Leukemia) which is a life threatening and has been in the hospital for the last 25 days and the treatment is likely to cost around ten lacs. (Patient details: In ICU, Uhid: APD1.0010736038, Patient IP No: DELIP 15809). Master Rudra Bansal, age 11 months. He is the son of Mr Sumit Kumar Bansal who is self employed and hails from The child is suffering from ALL (Acute Lymphocytic Leukemia) a life threatening aliment and has been in the hospital for over a month and the treatment is likely to cost around 8-10 lakhs. (Patient details 5th floor T2 Ward, Uhid: APD1.0010733599, Patient IP No: DELIP 15716). 3. Baby Dhaniya, age 10 months. She is the daughter of Mr Saurabh Rajawat a primary teacher in a private school near Nagina Chowk, Dhampur. The child is suffering from Acute Lymphocytic Leukemia again a life threatening disease and has been in the hospital since three days and the treatment is going to cost around 7-8 lakhs. (Patient details 5th floor T2 ward, Uhid no: APD1.0010728288, Patient IP No: DELIP 16023). Read … Gloom behind the Smile & Refractions … from the Prism of God … books that describe the fight of cancer patients. On 24th December 2016, Apollo Hospitals celebrated their ‘Brave Hearts’ day, where the recognition was announced. It was a glittering function held in their auditorium at Sarita Vihar in Delhi. Where, apart from little brave hearts. The function was well attended by Doctors, officials, parents of brave hearts and NGO staff. Shravan Charity Mission was registered in 2010. But due to unavoidable circumstances it could start work only in 2012. Since then it has touched many lives. On this sterling moment we would like to thank Apollo Hospitals for their cooperation in bringing about the best in us. And we pledge to continue with our mission. So true! And quite undoubtedly, when cancer strikes, it takes you to those long and dark tunnels, from where you need only a warrior’s might to return. And, as a part of our NGO activity today, I met two bright young, smiling girls braving it out, with cancer. They were nothing else, but an unrelenting streak of energy and confidence. And I’m more than sure they will be out of the scourge soon. And, to help them smile we made a contribution towards their treatment. So join us in wishing them the best. Neha KumariMiss Neha Kumari, age, 15 years, is from Katihar, in Bihar. She doesn’t have her parents and she is here with her uncle for treatment, who happens to be a student. The family income is a measly five thousand rupees. 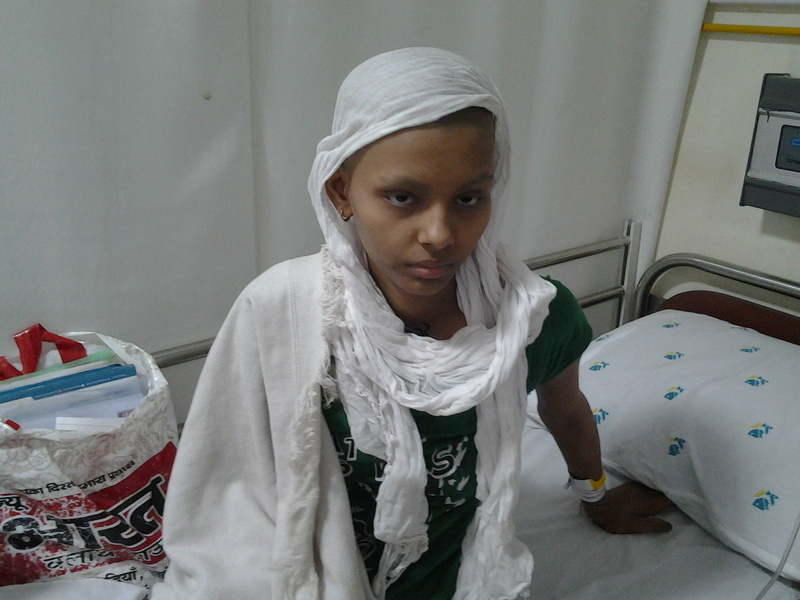 She is suffering from ALL (acute lymphoblastic leukemia-blood cancer) and the treatment will cost around rupees 4 lacs. We wish her all the best. 2. Miss Sheetal Sharma, age, 13 years, is from Faridabad. Her father is a driver and earns a monthly salary of around seven thousand. 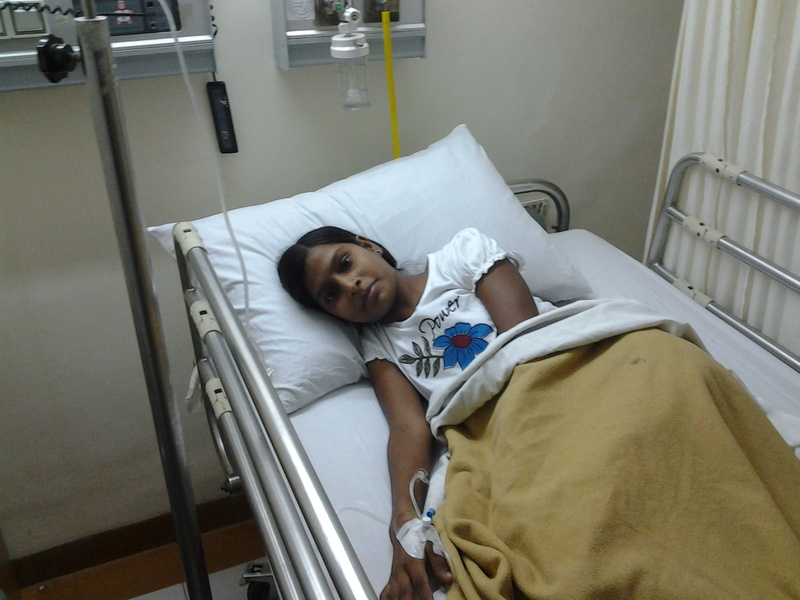 She has bone cancer, for the past one year and the treatment, will cost around rupees 6-8 lacs. We salute the uncle of Neha, and parents of Sheetal for tirelessly fighting the battle. On two occasions we visited these poor unfortunate children in the hospital to distribute toys. Surprisingly, some of them were from foreign lands as far as Mauritius. 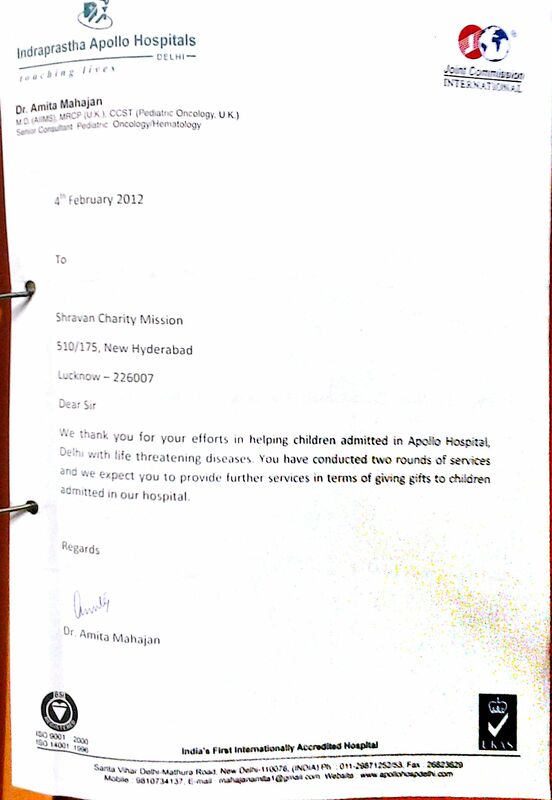 The hospital letter speaks of our little effort in bringing about smiles on these otherwise dull faces. And at times we do wonder why such tiny little children get cancer? Article: ARE RURAL SCHOOLS PLAYING WITH THE FUTURE OF OUR CHILDREN AND INDIA? NGO Pratham has done well in bringing out an outstanding report called the Annual Status of Education Report (ASER 2014). ASER is an annual household survey to assess children’s schooling status and basic learning levels in Reading and Arithmetic. It is the tenth such survey facilitated by Pratham. This is the largest and most comprehensive annual household survey of children in rural India. It surveyed 16,497 villages located in 577 districts across India covering 341,070 households and 569,229 children. India, would love to hear, that enrolments in schools, are at a level of 96% and that too for the 6th year in a row. So, most of our kids are now at least, sauntering down the school classrooms. And, to toast the occasion there are regular mid-day meals, to take care of their nourishment and over 80% of our schools have improved infrastructure. And the buck doesn’t stop here, as 75% of rural schools now have provision for drinking water, while 65% even have toilets, which is significantly higher than about half a decade ago. Almost 50% of the kids in class 5 cannot read simple sentences that are taught in class 2. 50% of the kids in class 5 cannot do basic two digit subtraction which is taught in class 2. So then what is going on in these schools? As half of our school children after having spent more than half a decade in school cannot read basic sentences and do even simple arithmetic; when they could have learnt this in 2-3 years of urban education or in any private school. So do these teachers employed with these schools have any accountability? SO THEN, WHERE ARE HEADING TO? Are these schools responsible for creating a talent pool in our country or are we just to rejoice over enrollment numbers and mid-day meals and forget the core issue of educating our children. In the literacy chain of India this could be the weakest link. For what is literacy anyway? Is it just being able to write your name or learn the bare minimum skill of being able to read and solve those basic arithmetical problems. A skill that you will require lifelong. Or is it something much more than that. Basic skill of reading and arithmetic is vital for survival in today’s world; as life in any form will require these skills. And if the basics are not strong. No matter how much of education you add in later years will only go for a waste. As the data explains adding number of years of education to such laggards will be of no use. And, also, such laggards though counted in enrollment will never get educated. And, mind you the percentage of such students is very high, and at a staggering fifty percent. India could have lived with a miniscule percentage of such students but because it is half our students, it depicts an applecart failure in our education system.